Patrick: There’s a certain magic to the first time you experience a genre or franchise or medium. Novelty is cruel in this regard: no matter how good a sequel is, part of the luster disappears when you revisit the well. 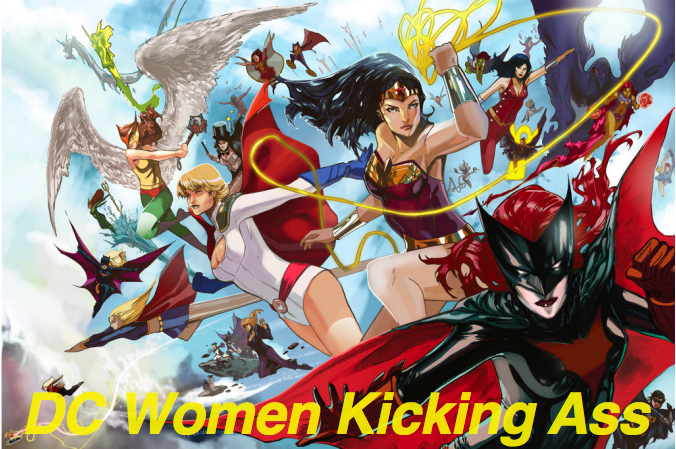 Comic book creators and fans know this too well — every reboot and relaunch is a promise to recapture whatever it was you first loved about superheroes in comics. What’s insane about this approach, is that we all fell in love with comics at different times, reading different books and for different reasons. What one person thinks of as “classic” Batman, another thinks of as new and hackneyed. There’s no guarantee that a “back to basics” approach is going to mean the same thing across fandom, never mind whether or not it’s valued the same way. As the Original X-Men wrap up their adventures in the Ultimate Universe, writer Brian Michael Bendis ruminates on just what it means to try to recapture the greatness of the original. Bendis’s first point of scrutiny is actually the least meaningful to this series: Miles Morales. Ultimate Spider-Man’s popularity is an anomaly, and there’s really no accounting for it. It’s a universe populated with most of Marvel’s characters, all of whom are beloved in some capacity in their home universe, are all but ignored or spurned by readers. After his army takes down the invading force of X-Men, Doctor Doom muses over the unconscious body of Spider-Man. Doom is asking how Norman Osborne stumbled on to a formula that made such an effective superhero, but Bendis is also asking himself how he stumbled on to a formula that made such an effective character. Was Bendis’ successful because he gave Miles’ a lot of the same traits Peter had? Maybe Miles was successful because he was so different? It’s impossible to know — all that we do know is that we like Miles Morales. Miles is an example of of the relaunch gambit working — tinkering with a character actually yielded results that make Spider-Man feel more like this Platonic ideal of “Spider-Man.” That was the goal of all these Ultimate characters to begin with: they could act as a reset button for the readers’ experience. This whole issue is obsessed with capturing the excitement of the first time and that’s perfectly in line with the goals of the Original X-Men. Check out how giddy Jean is when she realizes she’s about to go telekinetic-toe-to-telekinetic-toe with Doom for the “first” time. 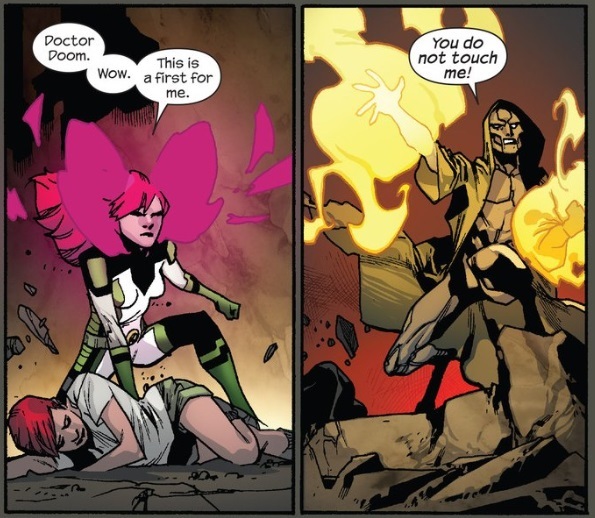 Obviously, this isn’t the first time “Jean Grey” has done battle with “Doctor Doom,” but Bendis and artist Mahmud Asrar give the moment the same gravity that the character feels. There’s the added wrinkle that this will undoubtedly be the first time many readers will have seen a confrontation between these two characters — I’m pretty sure I’ve never seen a fight between Jean and Doom before — so, in that regard, the imitation of novelty becomes indistinguishable from the real thing. Just like Miles Morales before, this is a successful recreation of material that already made an impact years ago. Once the X-Men finish showing Doom what’s what, and Hank blows up the castle just to spite him, they get back to the serious business of returning to Earth-616. That means guiding a still-freaked out Carmen through a few alternate Universes until she stumbles back on the right one. Again, there’s a pretty clear parallel to the kind of anxieties new writers must face when attempting to reboot well-known franchises. She panics and ends up opening portals to some crazy places — some of which I half-recognize — but even when the results are interesting, she abandons those universes as failures. 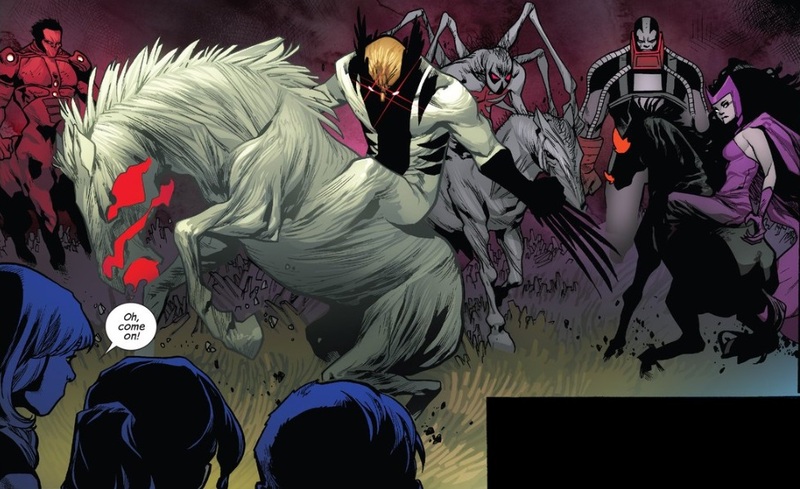 I’m not the most well-versed in Marvel alternate universes, so I’m sure there are references here that fly over my head, but I did recognize Old Man Logan duking it out with The Thing and that alternate universe version of Age of Apocalypse where Spider-Man, Wolverine, Scarlet Witch and and Red Hulk became techno-fused horsemen. Tellingly, Jean and Jean have to offer Carmen guidance to get them home. Bendis is very specific in this point — they can’t force her to make good decisions, they can only help her tap into that original set of synapses that fired the last time she visited the Marvel Universe proper. When we do finally return to our home Earth, Beast decides to double-down on the promise of the Original X-Men and vows to do more to make the world (or universe or multiverse or whatever) a safer place for mutants. That’s an ideological reset for Hank, and I guess my question for you, Michael, is: does that work for you? Has Bendis tapped into an honest desire to recapture the feel of the Original X-Men or is he forcing it? Does he maybe just need a pair of Jeans Grey to psychically calm him down? Michael: I mentioned this in my write-up of Uncanny X-Men 30, but the complex continuity and character history of the X-books is a double-edged sword: it allows for so many crazy stories like this one to happen, but it leaves newbies scratching their heads a bit. Patrick, I love the fact that you grabbed onto Bendis-as-Doom’s soliloquy at the success of Miles Morales; I would take it one step further however. Out of all of the Ultimate books, Ultimate Spider-Man has always been the most successful. Mark Millar’s The Ultimates had phenomenal start but it severely dipped in quality, along with basically every other Ultimate series. Ultimate Spider-Man is arguably the main reason the Ultimate Universe has lasted as long as it has. It’s a good book, so I suppose that’s reason enough for it to be so popular. With the issue of Miles Morales however, I feel like it’s the fact that Marvel fans can have their cake and eat it too. We can have Miles Morales in the Ultimate Universe, but also have Peter Parker alive and well on Earth-616. Bendis was one of the founding fathers of the Ultimate Universe. With Spider-Men and now All-New X-Men it’s fitting that he is also the first to break what at one point was Marvel’s unbreakable rule: “The Ultimate Universe and Earth-616 will NOT crossover. Period.” Well, never say never, I guess. I can’t help thinking that we mostly closing the door on the Ultimate Universe once Secret Wars wraps…but I digress. 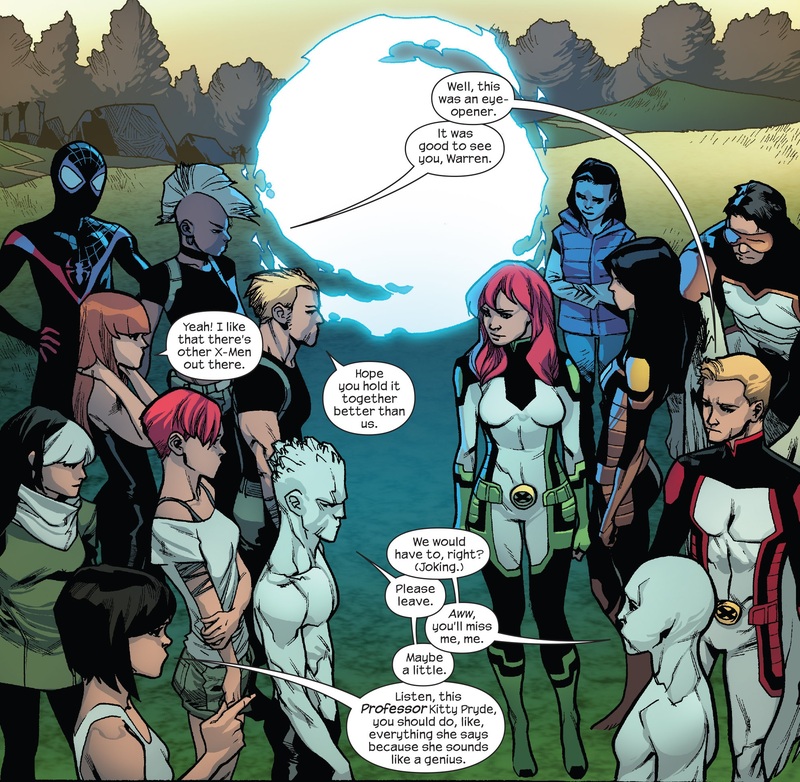 I like the technique that Bendis uses of having the Original X-Men stand in as tourists for the Ultimate Universe. Because I only remember a handful of things going on in that crazy place otherwise. These Original X-Men have seen alternate versions of themselves, future versions of themselves and even further future versions of themselves. At this point there is no way that these X-Men will grow up to be the adult versions of themselves that we know and love (?) 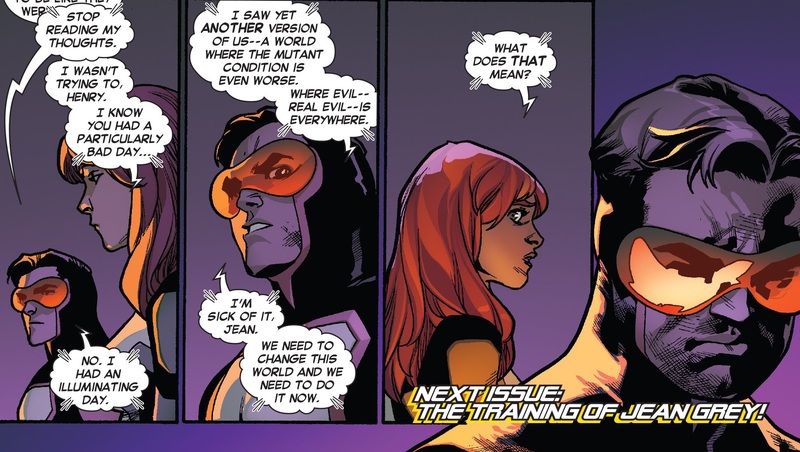 Bendis has always given All-New X-Men that kind of Terminator 2 “No fate but what we make” vibe. I think that this Jean Grey is determined to be someone drastically different from the ever-dying (and frankly wet blanket-y) Phoenix that we knew. I suppose this is a roundabout way of answering your question Patrick, but I don’t think Bendis is necessarily forcing anything in recapturing the vibe of the Original X-Men. I think given all of the crazy circumstances that they’ve been through they have developed naturally and honestly. To completely contradict everything I just said, Beast’s more proactive stance on “changing the world for mutants” seems very much like the blue-furred Beast that brought these youngsters into the future in the first place. In that respect, Bendis is echoing one of the central arguments of X-Men since day one: how do you affect change? Do you take small victories where you can get them, or do you make bold moves? Are you Martin Luther King Jr. or Malcolm X? Professor X or Magneto? Both Bendis X-books make a lot of crazy stunts (almost TOO many), but the general war of ideologies that Stan Lee implemented when he created the X-Men is definitely still there. Also, young Cyclops is still in space with his dad…right? Like I said, crazy business in those X-books. Bendis mentioned in an interview right after the Secret Wars announcement that he knew the Ultimate Universe was ending for a while, and stories like this one have been his way of saying goodbye to the universe and finally telling some of the stories he’s always wanted to tell with it before it’s gone. It may have dragged on a bit (Bendis books really need to double ship), but honestly, I had a lot of fun with this storyline. I’ll actually be a bit sad to see the Ultimate Universe end, as this story proves that it has a lot to offer 616 even if, as a line of its own, it kinda imploded under continuity that quickly became more complicated than 616’s long ago.